First, let’s review what I wrote last year and see how many I nailed. Last year I said 2013 would provide us with these goodies. I think I nailed 6 out of 8. What about my predictions for 2014? Just creating private On Air Hangouts that you can schedule will bring a LOT of marketers to the platform. And with the integration of YouTube comments – I see a BIG boom in the creative use of G+. Forget audio podcasts – the videocast (or the AMAZING “TweetCast” format) will be the big happening thing of 2014. The TweetCast format brought to you by Nestivity is my favorite way to present right now. Look for more of this type of presentation (G+ HOA + Twitter Chat =TweetChat) in 2014. There will be a split among marketers on how they spin the drop in organic Reach. What they say and suggest about Facebook will further confuse small businesses who are just now getting online. Half will spin the drop in organic Reach to promote the act of buying ads. The other half will say – get out of Dodge – or at least don’t put all your social eggs in one basket no matter how HUGE the basket is. I predict a heated debate replete with data to back up both sides. Here’s a tip — move your potential buyers to your email list no matter which way you spin. There will be a renewed interest in Twitter (as a backlash to Facebook’s lack of organic Reach) and Twitter ads will take off. The Subbable-type funding for Channels will grow. I predict that more and more Channels will fund themselves and release themselves from the Google Ad Complex. I don’t think there will be a mass exodus from YouTube as some have suggested (because of the YouTube/G+ comment integration). The recently released Map feature is brilliant. I predict we will see several more innovative structures within the Pinterest interface making it even more addictive (this is a duh prediction). I hope they also allow us to create Folders or Lists to sort out the stream a bit more, too. The Local connection interface will become more important. Those magical features on your phone that show you what’s going on where you are will grow. Businesses will figure out that this is where to spend their time and money to bring in more customers. I want a phone that buzzes me when something it knows I like is close by. I like having a second brain in my pocket. So, in a nutshell, 2014 Will Be the Year of… Rearranging. Yeah, not so snappy, but I think people and businesses will be examining their time and attention — and MONEY — and rearrange where they spend those precious commodities. 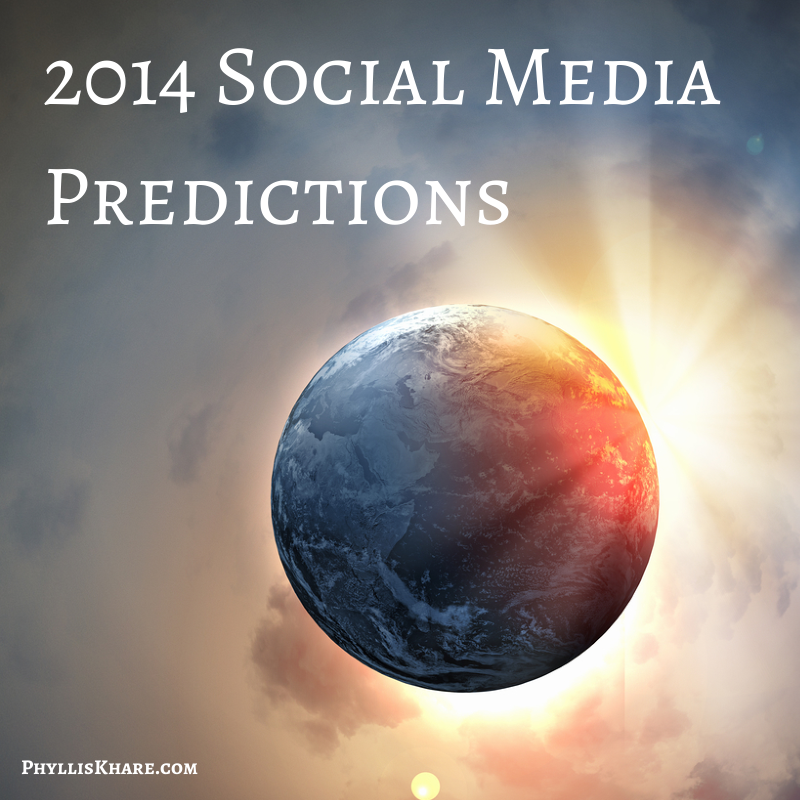 Here are some other predictions from some of my favorite online (and offline) people and sites. Got any other great Prediction posts? Put them in the comments. Huge thanks for the mention Phyllis! We enjoyed learning from the way that you incorporated G+ Hangouts with Nestivity’s Tweetcast for your online courses. Happy Holidays and Happy New Year! Thanks! I’m really looking forward to a few cool things using the system in 2014. It worked so well for our launch that we absolutely need to use it again during the Spring opening.